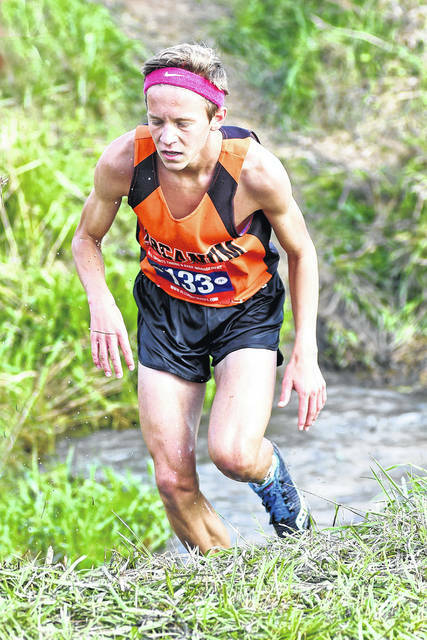 Arcanum’s Tanner Delk won the Cross County Conference boys individual cross country title on Saturday at Tri-Village. Delk completed the course in a time of 16 minutes, 39.38 seconds. The Arcanum boys teams also won the team championship with a score of 64. It was the first time in 25 years the Trojans have won the CCC title. Franklin-Monroe’s Cole Good finished in fifth place individually on Saturday in the Cross County Conference cross country championships at Tri-Village. 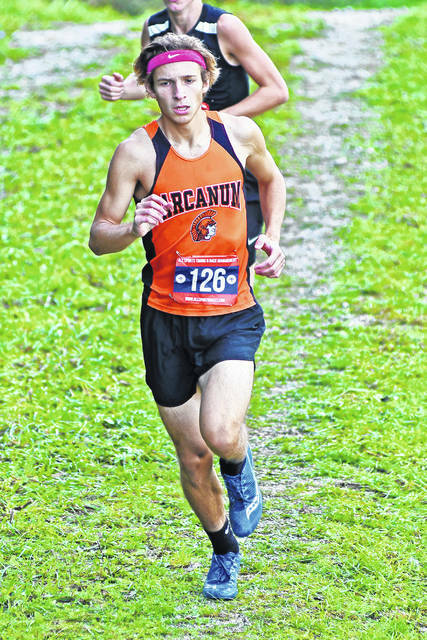 Arcanum’s Logan Todd finished in ninth place individually on Saturday in the Cross County Conference cross country championships at Tri-Village. 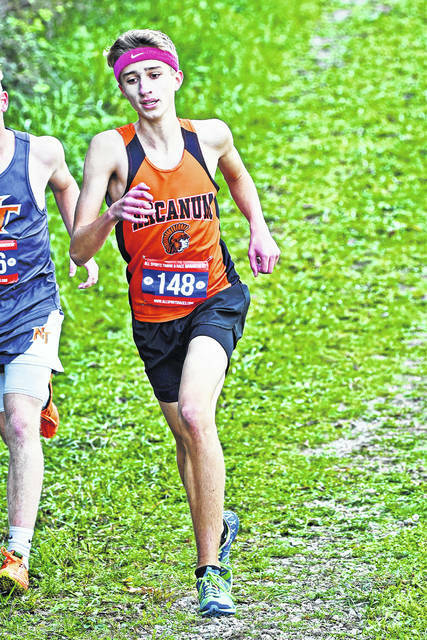 Arcanum’s Landen Kreusch finished in 14th place individually on Saturday in the Cross County Conference cross country championships at Tri-Village. 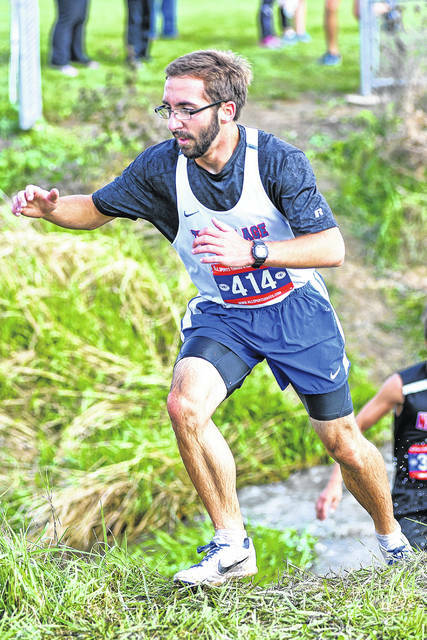 Tri-Village’s Harley Ketring finished in 17th place individually on Saturday in the Cross County Conference cross country championships at Tri-Village. 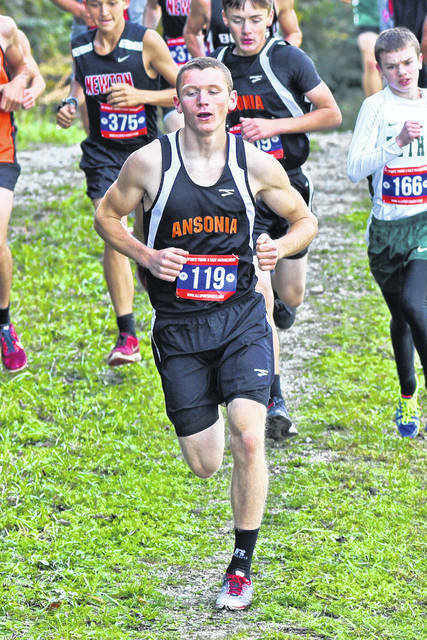 Ansonia’s Logan Warner finished in 18th place individually on Saturday in the Cross County Conference cross country championships at Tri-Village. NEW MADISON – The Arcanum boys cross country team dominated the Cross County Conference League meet on Saturday. The Trojans took home the team title for the first time in 25 years with score of 64 and crowned senior Tanner Delk as the top runner overall with a time of 16 minutes, 39.38 seconds. Franklin-Monroe finished in 6th place with 157 points as a team with senior Cole Good taking the 5th overall individual spot with a run of 17.27.23 and Brendan Hosler (19:13.12) finished 27th. 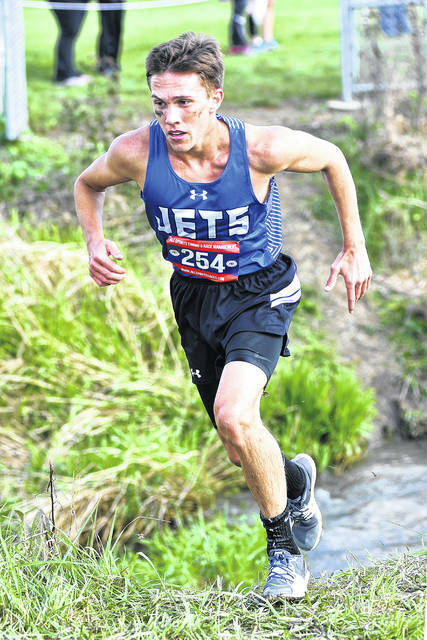 Also for the Jets, Xavier Gilliland (19:18.18) finished 30th followed by Ross Thayer (19:55.52) in 47th place, Jacob Meyer (20:00.66) in 48th place, Dylan Brumbaugh (20:23.74) in 54th place and Logan Garber (21:18.11) in 63rd place. Ansonia (252 points) finished 9th as Logan Warner took the 18th individual spot with a run of 18:39.38. Also for the Tigers, Chad Millikin (20:10.2) finished in 50th place, Kyle Thornhill (20:57.56) came in 57th place, Garrett Kaiser (21:00.28) placed 58th, Michael Hall (22:41.86) finished in 69th place, Andrew Thornhill (22:48.97) finished in 71st place and Trenten Case (24:02.21) came in 76th place. Tri-Village (327 points) finished 11th as a team with Harley Ketring grabbing the 17th spot running 18:38.44. Matthew Holzapfel was next for the Patriots in 64th place with a time of 21:18.36. He was followed by Ryan Stephan (26:30.13) in 80th place, Cameron Armstrong (27:05.98) in 82nd place and Kamran Stucky (31:04.63) in 84th place. Mississinawa Valley (332 points) finished in 12th place led by Dalton Marker (20:41.9) in 56th place. Jacob Dircksen (21:01.54) was next in 59th place with Roman Dircksen (21:48.61) in 67th place, Mikey Rammel (23:05.89) in 73rd place, Jacob Dirmeyer (24:02.6) in 77th place, Connor Buffenbarger (26:48.02) in 81st place and Davian Trump (33:17.14) in 85th place. Bradford (340 points) finished in 13th place with Jackson Moore finishing 22nd overall with a run of 18:53.41. Shane Bryan was 94th overall in a time of 23:43.7 followed by Jared Shellabarger (25;21.6) in 104th place, Hunter Biddlestone (25:49.3) in 107th place and Andrew Moyer (40:37.9) in 119th place. This entry was tagged Ansonia, Arcanum, Bradford, CCC, Franklin Monroe, Mississinawa Valley, Tanner Delk, Tri-Village. Bookmark the permalink.